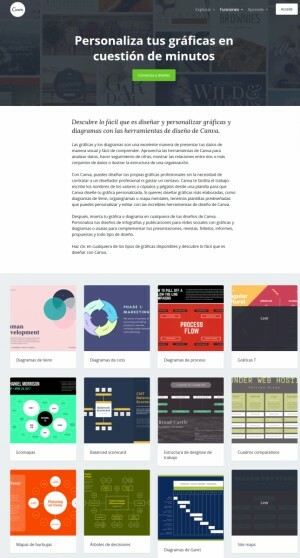 Canva, the tool that makes graphic design for content available to all NGOs, offers a recent version in Spanish to make it even easier to work and avoid confusion that the portal can produce in English. Canva is the tool that makes graphic design for content available to all NGOs. We spoke about it in this March 2016 article: Canva for Nonprofits, a graphic design tool for NGOs. Well, Canva now offers a recent version in Spanish, to make it even easier to work and avoid confusion that may occur to many people with the portal in English. Therefore we update the links of that article and we present them here: Canva in Spanish; Canva for Nonprofits in Spanish. The registration form to Canva is also in Spanish. From the organization they have worked "very hard to create content in this language so that all our users feel welcome from the beginning," says Maria Fernanda, Canva team. In addition to the home pages with the new version, there are also very interesting features that are now available in Spanish. Some of them are: to create images for social networks; or the photo editor; the tools for graphics are also in Spanish; materials and tools for teachers; as well as to create reports. Canva and iWith coincide in a part of our missions helping NGOs take advantage of the opportunities offered by the Internet. We hope that with these advances, organizations can improve your work even more.